Decomposing Bodies is a project of the Visual Media Workshop in the Department of History of Art and Architecture at the University of Pittsburgh, under the supervision of Dr. Alison Langmead. Decomposing Bodies is focused on the creation, curation, and management of a data-rich digital collection of archival objects dealing with representations of human bodies and the history of identity, identification and incarceration in late 19th- early 20th-century America. Alphonse Bertillon (1853-1914), a French policeman, anthropologist and inventor, developed a system of criminal identification that sought to classify human beings on individual standardized cards, each containing a consistent set of biometric measurements and observations. This process, now known more familiarly as “Bertillonage,” was essentially a system that disassembled the visual forms of the human body into small pieces so that the police could individuate, and thus identify, a single human body from others. In the autumn of 2014, Alphonse Bertillon comprised a tiny portion of the Visual Media Workshop’s research agenda. Bertillon had only one bullet-point (or “task”) on Asana, the project-management application that the VMW team uses to track research and productivity. To provide a comparison, most projects have twenty tasks, at a minimum, running at one particular time. 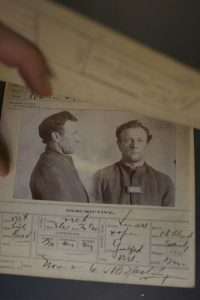 Since then, Decomposing Bodies has become a collection of the digital images of more than 25,000 digital images of more than 12,000 identification cards depicting prisoners at two Ohio institutions, the Ohio Penitentiary, and the Ohio State Reformatory. Digital photos of these cards were created from the collection of the Ohio History Connection, in Columbus, OH. This website chronicles the research process, and the variety of related topics that have arisen throughout the intervening years since the project’s conception. We have been working to digitize, transcribe, research, and maintain this collection. Over the years, more than a dozen students, both at the graduate and undergraduate levels, and in departments including Library and Information Science and History of Art and Architecture, have worked on Decomposing Bodies, engaging with these objects and the people, histories, and institutions they represent.